This is my new favorite warm weather salad! 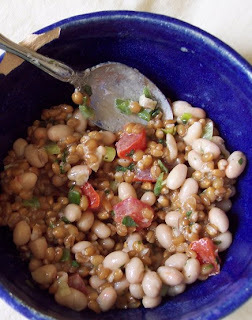 The heartiness of cooked wheat berries paired with the tanginess of a lemon vinaigrette really says 'summer'. It's super simple, totally filling, and absolutely delicious. Mix the dressing by stirring all the vinaigrette ingredients together in a medium size bowl. In a large bowl, mix the salad ingredients. Pour the vinaigrette over the salad and mix well. Let chill for several hours to let the flavors blend (or, if you just can't wait, do what I did and dig in). Yum!